– any further comment will automatically be published. In « identifiant », type the user name you want to use on this blog. The site will send you a password to the email you just typed. 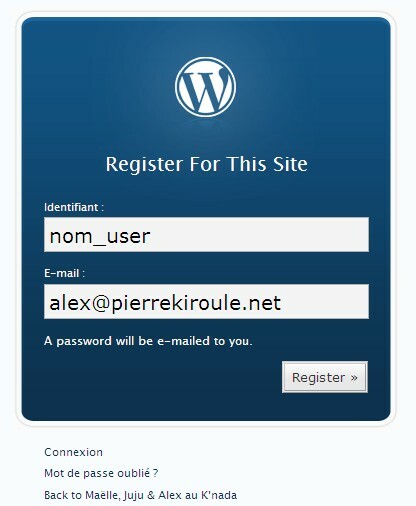 Use the connection link to connect to the blog: type the user name and password you just received by email, and click on « connexion ». In the next page, you can modify the password (and use one that you can easily remember) and some of your personal information if you wish to. Save this with a click on “Mettre a jour le profil”. Now you can get back on the main blog as your newly created user with the « View Site » link on the top right corner of the page, or just by using a link to our blog. Write and submit your first comment on a post: we will automatically receive an email, and we’ll approve and publish this first comment manually. Once your first comment has been manually approved, every new comment you submit with your user name will automatically be published without further steps from our side. – using, in the same menu, the link to a map where you’ll see markers on a map for some of our pictures, you can then browse pictures by location (the geo tagging information is not yet completed). C’est un très beau blog que vous avez là!! j’aimerais juste que tu me dise … lorsque je met un identifiant il dit que c’est incorrect… je ne comprend pas pourrais tu m’expliquer Alex? PS: je ne pense pas indispensable de publier cet article mais je ne savais pas ou écrire ce message! Nous espérons que vous avez bien récupéré du décalage horaire et que la rentrée se passe(ra) bien. J’ai fait livrer un deuxième catalogue d’outils, après je me suis calmé.